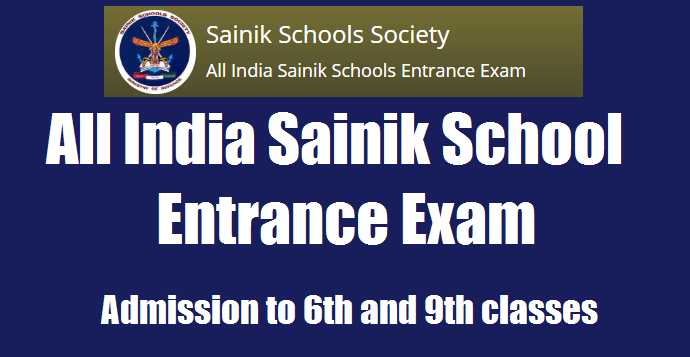 AISSEE All India Sainik School Entrance Exam 2019 | Sainik Schools Entrance Exam 2019 for Classes VI & IX Admissions | Applications Exam date, eligibility, Exam pattern : The All India Sainik School Entrance Examination (AISSEE 2019) notification released on the official website sainikschooladmission.in. The Sainik School Society will conduct a national-level entrance examination to be held on 6th January 2019 to select students for admission to classes 6 ot 9 in 26 Sainik Schools across the country. All India Sainik School Entrance Exam AISSEE 2019 online applications , hall tickets/ admitcards, exam pattern, Results | Sainik School AISSEE 2019 application form at sainikschooladmission.in / #SainikSchool #AISSEE Entrance exam 2019 admit cards at sainikschooladmission.in. Korukonda Sainik School Entrance Exam Notification Online apply 2019, Kalikiri Sainik School Entrance Exam Online registrations. The All India Sainik School Entrance Examination (AISSEE 2019) notification released on the official website sainikschooladmission.in . The Sainik School Society had conducted a national-level entrance examination on January 6. The exam was held to select students for admission to classes 6 ot 9 in 26 Sainik Schools across the country. As per the schedule released by the exam conducting authority, interview and medical exam for the admission will be held from February 11, 2019 to 28th February 2019. The Sainik School will release the final merit list including the waiting list on February 4, 2019. The exam for class 6 was held in English and Hindi. The question papers for class 9 was set in English only and students are required to answer in English. (i) Andaman & Nicobar Island Sainik School, Purulia. The written Entrance Examination will be held on 06 th January, 2019 from 10.00 onwards. Detailed programme will be intimated by the conducting Schools. Due to change in format total number of questions in class VI as well as IX may change. Minimum qualifying marks: The minimum qualifying marks for general category candidates as well as children of Defence Services Personnel and ex-servicemen will be 25% in each subject with 40% in aggregate. In the case of Scheduled Castes and Scheduled Tribes candidates, minimum qualifying standards are not required and they will be admitted on the basis of inter-se merit at the Entrance Examination within these categories. In case a SC/ST candidate comes in the general merit on his own, he would be admitted against general seat and will not be adjusted against the reserved share of SC/ST seats. 300 marks prescribed for Written Examination for class VI and 400 marks for class IX. The merit list for admission to the Sainik School would be compiled on the basis of marks obtain by the candidate. In case there is a tie with regard to overall marks, the marks for mathematics would be considered. In case there is a tie here also the marks for English for Class IX and Intelligence Test for class VI will be considered and thereafter the marks for General Science for class IX and Language for class VI. In case there is a tie there also the boy younger in age will be selected. Marks obtained in the written test will determine his position in the final merit list. The OMR-based exam for class 6 will be held in English and Hindi, whereas, the class 9 exam will be based on English and the students will be expected to answer in English. The exam for class 6 will be held in English and Hindi. However, the question papers for class 9 will be set in English only and students are required to answer in English. The paper for class 6 will consists of 125 questions which will carry 300 marks. Of which Maths is for 50 questions, GK 25 questions, Language 25 questions, Intelligence 25 questions etc. Class 9 paper will have 400 marks in which there are Maths 50 questions, Intelligence 25 questions, English 25 questions, General Science 25 questions, Social studies 25 questions etc. a) 15% of the total seats are reserved for Scheduled Castes and 7½% seats for Scheduled Tribes. b) Out of the remaining, 67% of the seats will be reserved for boys from the State in which the Sainik School is located. Balance 33% left over of seats will be thrown open to boys from other States and Union Territories in the ratio of their male population. Any unutilized seats in this category will be merged with home State seats (In this connection, please refer to this office letter No. 4(1)/SSS/2016) dated 5th July, 2017) in order of merit. c) 25% seats are reserved for children of service personnel including Ex-servicemen. For Online Registration Form, Age criteria will be : For Class VI, age should be 10 - 12 years as on 31st March 2019 and within 1st April 2007 –31st March 2009. 3. Important Point: - Registered candidate will have to make online payment within 48 hours of registration or else his/her form will be discarded and he/she will have to do the fresh registration.